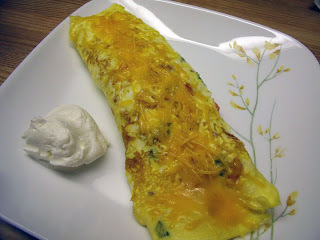 My favorite omelette is a southwestern omelette. The following recipe serves 1 Hungry Jerk. It's simple, it's colorful, and it tastes heavenly! Set a lightly greased frying pan to medium heat. In a small to medium sized bowl, mix your eggs and milk throughly (I use a fork or whisk). Whisk until the mixture looks like it is one color (a lovely orange color). Set egg mixture to the side. Dice veggies and add to your egg mixture. 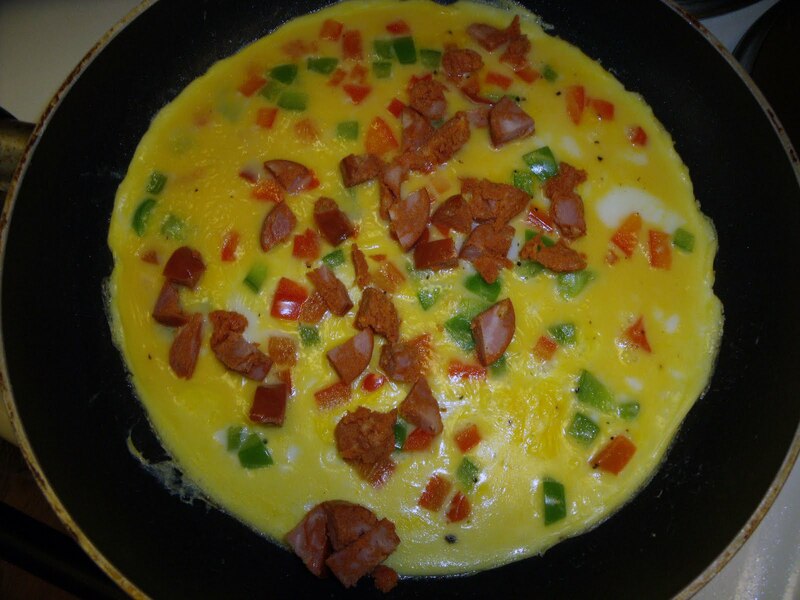 Add the omelette mixture to the warm pan. Add salt and pepper to the top of the omelette. Now it's time to let your omelette cook for a few minutes. Keep an eye on it and once you can, take your spatula and run it around the rim of the pan and seperate the egg from it. Then you know it is about ready to flip. This is the time where you add in your cooked meat. Sprinkle it in a line down the middle of the omelette. 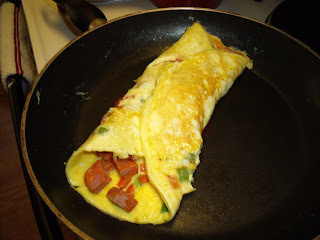 Now, fold one side of the omelette inwards (lengthwise over the meat) and cook for a minute or two before flipping the other side in as well. Allow this to cook another minute. Now here comes the tricky part. I'm not very good at flipping whole omelettes with one spatula, so I use two. Very carefully flip the entire omelette over. Let this cook for a minute or two to allow the two flaps on the bottom to 'seal'. Now is a good time to sprinkle cheese on top of the omelette. Turn off the heat and get your spatula(s) ready. 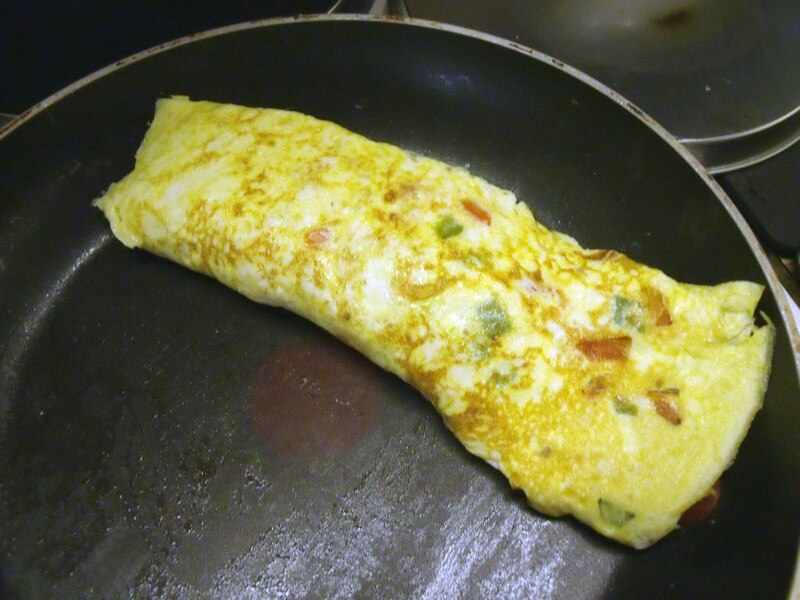 Very carefully lift the omelette off of the pan and onto a plate. Top with sour cream and salsa (or to the side. Whatever you like!). ENJOY. Wonderful. Definitely trying this, am loving your recipes! I hate typos. Let me try this again!